Magic armors have never been the most exciting magic loot in the pile. Players tend to be more interested in the devastation that a magic weapon can wield, or the various and sundry miscellaneous abilities that wondrous items can provide. Magic armor has always been the solid, workhorse style of magic item: it gives you a bonus to AC, nothing fancy, nothing to get all that excited about...until now. 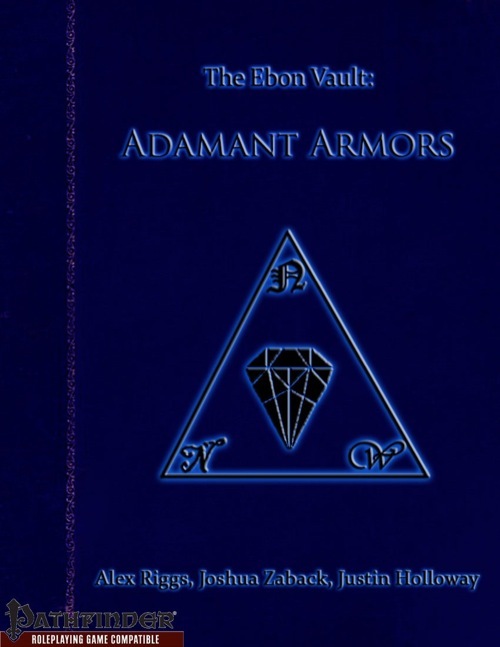 The Ebon Vault: Adamant Armors endeavors to make magic armor more exciting. It packs six new special materials to craft armor from, and over 30 new armor special abilities—which focus on making armor more dynamic and enjoyable to use. Further, it contains a number of mundane enhancements for armor (such as laminated plating, or camouflage), which are available at early levels and allow players to customize their armor and gain some mechanical benefit from doing so. Finally, the book contains 12 specific suits of armor, with unique special abilities, as well as in-depth backgrounds and physical descriptions. This pdf is 33 pages long, 1 page front cover, 1 page editorial, 1 page advertisements, 1 page SRD and 1 page back cover, leaving 28 pages of content, so let's check them out! Following the tradition of NNW's books, we kick off with a nice little story to introduce us to the matter at hand and said matter is magic armors. 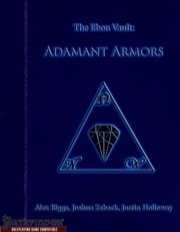 As with other installments of the ebon vault, we start off with new materials. In contrast to e.g. the "Swords of Legend", though, the materials are rather mundane: Bone, gold, stainless steel. While there are some other materials like djinnsteel and ghoststeel, and they all have their place, none truly wowed me. 13 different mundane enhancements for armors are also provided, offering not only fodder for low-magic campaigns, but also for the small purse - neat! From fur-lined armor to one that can easily be donned and taken off, they all come with a minor price, but definitely rock and range in the affordable price-range of 25 GP to 500 GP. The main material of the pdf, though, would be the 32 new armor qualities, ranging from a modest +100 GP to the equivalent of +5 bonuses. Unfortunately, this section has completely managed to underwhelm me by providing a plethora of abilities that grant flat-out immunities (something I try to avoid) to self-repairing armors, I have some balance concerns here. The Mage Bane armor makes you completely immune to one spell you can freely choose each day. Unfortunately we don't get any mechanics or specifications on whether the wearer has to have seen the spell in action or even be aware of its existence in-game. This essentially makes the armor dependent on meta-game knowledge, which in my opinion is an example of bad design. The +300 GP (+1000 GP per enhancement if the armor is magical) 1-time-use enchantment that grants you a second wind and prevents you from dropping below 1 HP once is one of the most op enchantments ever - cheaper than a scroll. At low to middle levels, this enchantment essentially is an extra life for the wearers. Perhaps that's me, but I won't allow this in my campaign. A 300 GP-enchantment should not enable a thief in an otherwise mundane leather vest to survive a fall from the castle's tower. Or dragon's breath. You get the idea. Unfortunately, the 12 specific armors. We get, among others, an armor that prevents petrification and can use stone to flesh, an angelic armor of gold and platinum for the truly exalted etc. - essentially the standard fare. The two armors that stood out would be the armor of invulnerability, which makes you utterly impenetrable for any kind of damage against which DR works (which I consider op) and the living chain. This latter is the one armor that really felt cool and evocative to me: A collar with Kython-chains attached that come to life and hurt attackers while not impeding the dexterity of the wearer - while strong, the unique imagery and form of the armor make it compelling. Unfortunately, the other armors all were "been there, done that"-territory. Editing and formatting are very good, I noticed some minor punctuation errors, but nothing to impede my enjoyment of the class. Layout adheres to the two-column standard and the pdf is extensively bookmarked. The artwork is nothing to write home about, but ok. It comes with a printer-friendly version. Up until now, the "Ebon Vault"-series has continuously provided either intriguing mechanical concepts or evocative items. Unfortunately, this installment of the series falls terribly short of this standard. While the mundane enhancements are useful, most of the content herein just feels run-of-the-mill: From uninspired "You get immunity x"-armors to special qualities that are so damn broken it hurts over to a selection of specific armors that feel general with one notable exception, this pdf is vastly weaker than its much better and more imaginative predecessors. Thinking long and hard and rereading the pdf twice, I find myself hard pressed to recommend this pdf for anything but the mundane enhancements. In the end, my final verdict will be 2 stars, due to the low price. If you want armor and shield qualities that rock, check out RiP's "101 Magical Armor and Shield Properties" and if you want good magical shields, I'd recommend Purple Duck Games' "Legendary Shields" instead. Reviewed here and sent to GMS magazine.